The best room features the same Federal period moldings as the parlor beneath with plastered walls. This was the room Jason Russell and his wife would have slept in. The rope bed is covered with an intricately wrought stuff-work quilt made in 1838 by a C. Carpenter. 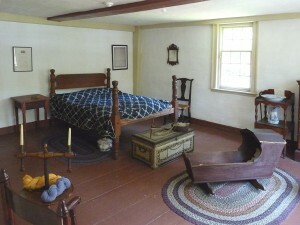 On the chest at the foot of the bed is a wooden cane, the only personal belonging of Jason Russell that the Arlington Historical Society owns. In the closet next to the fireplace are displayed, among other things, a 1793 wedding gown and a ball gown worn at the Peace Ball following the War of 1812.